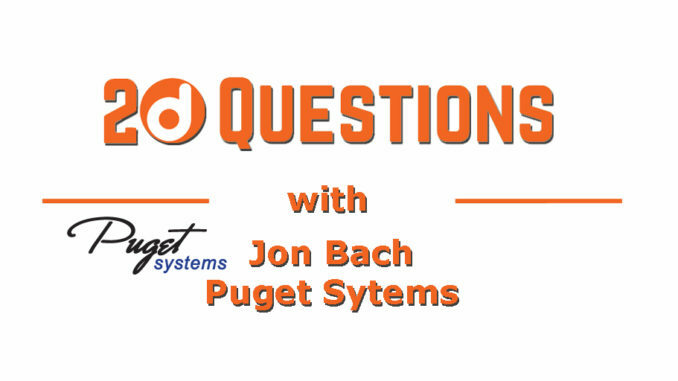 20 Questions returns with a chat with Jon Bach of Puget Systems. 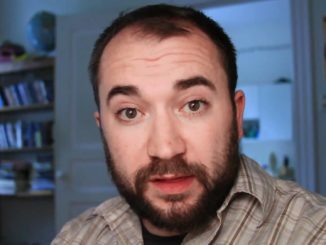 Jon started Puget Systems while he was a student in college. Working in a basement of a local printing company, Bach built a high end computer company with an emphasis of giving content creators, engineers, and scientists the right tools for today’s demanding computer landscape. I sat down with him to discuss where Puget Systems is, why their PCs make for great editing workstations, and what the future has in store. 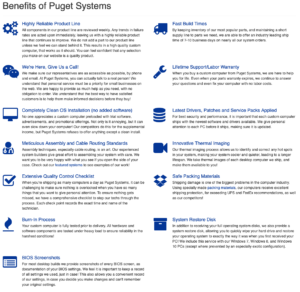 1: What is Puget Systems and what do you do? 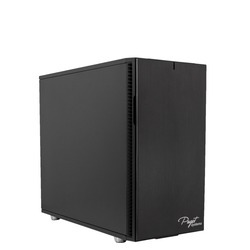 Puget Systems designs and manufacturers workstations for content creators, engineers, and scientists. We believe that computers are a tool to get a job done. In order to design that tool properly, we have to truly understand both PC hardware and real-world workflows. 2: Give us some backstory. What did you do before you started Puget? I got my start in technology during college, where I had the job of ushering a family printing company into the digital age, outfitting them with computers at each location, and building their website. That gave me the technical knowledge and experience I needed to start Puget Systems. 3: How did you get started in this business? I started Puget Systems as a “side gig” during college. I saw so many people with technology questions and needs that were not being well served by the large computer manufacturers, and wanted to run a business that put relationships first. 4: So, you’re a custom build shop? Yes, but probably not in the way you might expect. We look at a performance problem that needs to be solved in a real world workflow, and we design workstations that can meet those needs. We let that process take us wherever it needs to from a hardware design standpoint. What we don’t do, is have our customers tell us what hardware spec to build. Instead, we ask them to tell us what they want the computer to be able to do, and then we use our knowledge about their workflow to drive the hardware spec. 5: What kind of solutions do you offer? We offer workstations that sit on or under your desk, and servers. We value quiet operation, so you can have your workload running at full steam, while still being whisper quiet. We are experts in content creation, engineering, and scientific computing. 6: Who are some of your customers and why did they choose you? The customers that fit us best are the ones with performance problems to be solved, who are willing to let go of the problems they are having with technology, and let us take on that burden. These are customers that are so busy with their primary mission, that they need to focus all of their energies on that. We are especially popular with smaller independent studios and YouTube creators. We also have a LOT going on right now with emerging workflows like machine learning development and professional VR. Some of our customers are highlighted in our case studies. 7: How do you compete with some of the bigger established brands? Competing against the big brands is where we really shine. First, the big brands tend to charge a large price premium on their professional line. We can compete on price alone. But even more importantly, our smaller size allows us to have a relationship with each customer, which isn’t possible at the scale of the bigger brands. With this relationship, we can determine the optimized hardware for each individual’s workflow. It isn’t enough to build a workstation optimized for Adobe Premiere because that is still too broad. What codecs do you use? What resolutions? What plugins? What video transitions? With that information, we can save our customers from spending money on hardware that wouldn’t benefit them, or we can get them more performance for the dollar. That one-on-one approach can’t be replicated by the big brands, and is our distinct advantage. 8: Can you talk about why video cards are so expensive these days? If you look back to the early 2000’s, the CPU was the powerhouse in the computer, with the video card being used only for things like gaming. That has changed a lot in the last 20 years! Today, the GPU has turned into the powerhouse in the computer for many applications. Being massively parallel, it excels in tasks like rendering and encoding. Because the GPU can do so much of the work, it is getting more of the budget. Now…whether you SHOULD spend a lot on a high performance video card depends on your workflow and your software. There are still many use cases where we recommend against an expensive video card. For example, in Adobe Premiere you can likely get the same performance out of a $400 GTX 1070 as you can out of a $3000 Titan V. You could spend a LOT on either a CPU or a video card, so you have to know where it is best to allocate that budget. 9: Is the ARM chip that Apple is designing going to make its way into desktops? Or are we heading to a post PC universe like Apple touts? It is amazing the advances we’re seeing from ARM! The new iPad Pro is a very capable device. I think we will eventually see that move into desktops. The fact is, most users don’t have a need for super high-end hardware, so the question is, what is “good enough” for those people? As ARM advances, it can handle more and more of the “good enough” workloads. The real inflection point will be when ARM becomes performance competitive against Intel or AMD, and I can definitely imagine that happening in the next decade. But it won’t feel so much like a paradigm shift, as it will that you just have more options. Do consumers really care whether it is an ARM or x86 chip powering their device? No — what they care about is that it works. 10: Your workstations are pretty high end. Isn’t a computer just a computer? To finish your work, your computer has to perform, and it has to be reliable. At Puget Systems, that is our entire world. If you don’t care about performance or reliability, then yes, a computer is just a computer. To many consumers who are not using their computer for work, that is the case, and that is not wrong! But for professionals who rely on their computer to get the job done, the computer is a tool that has to perform that function quickly and reliably. That is what we do. Often times, that does mean it is a high end workstation. If our clients don’t need the performance of a high end workstation, they wouldn’t be coming to us in the first place with a problem to be solved. 11: What can your work stations accomplish that a $1,000 Dell with an Intel i7 or i9 can’t? It will get your work done much more quickly and reliably. It is common for our customers to tell us that their new workstation from Puget Systems make their work an order of magnitude faster to complete. Plus, if you have any questions or problems along the way, you can call us and we’ll actually know what you’re talking about! 12. You got started with AMD chips. But is AMD really competitive anymore or are they just keeping Intel honest? For content creation workflows, it still depends on what your priorities are. AMD has a definite advantage when it comes to performance for the dollar, so for those on a tight budget, you really should consider AMD. But…for the most part, when it comes to sheer performance, Intel still has the lead. That is changing quickly over time, however. AMD is REALLY close to being performance competitive to Intel, and I think they might get there in the next year. That will change everything. Every time there is a hardware or software change, we look at the performance again, and publish our results publicly. 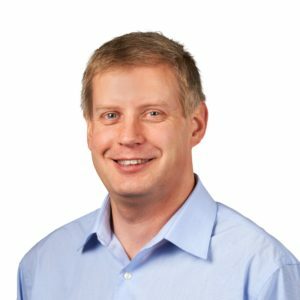 13: Is there a future for CPU-driven workflows, or is it all moving toward GPU-centric workflows? Thoughts on eGPUs? There is no one-size-fits-all answer to that question. 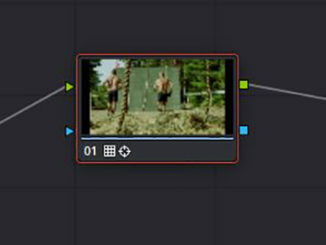 Almost all workflows are still a balance of both, and that will be the case for the foreseeable future. The question just comes down to how much budget you allocate to each side of the equation, and that changes with each software and user. For content creation overall, it will be continuing to shift towards the GPU over time, no doubt. What’s great about that, and great about external GPUs, is the fact that so much of the power, weight, and cost of the computer is in the GPU, and that can be disconnected. I personally love the idea of having a small lightweight laptop that I can take with me, but still have the power of the GPU when I sit down at my desk and plug it into the dock. 14: How do your workstations perform with higher performance workflows like visual effects rendering and virtual reality workflows? They perform great, because we have workstations specifically designed for VFX and VR! 15. On that note. What do you think of Virtual Reality? 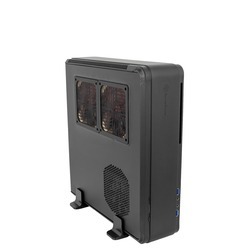 Where is it going from a computer workstation perspective? Just like anything else, VR is a tool, and we have to ask what functions that tool can perform. What’s great about VR and AR is how much it can immerse you into a virtual world, or augment the real world. Up to this point, VR has been more of a toy. Sure, it is fun to game in VR, and there is value in having that immersion. What makes me more excited, is the professional applications. VR can be used for dangerous environment training, for medical surgery, for construction planning, for data visualization, and more. That work is all happening today, and it is exciting to be a part of it! 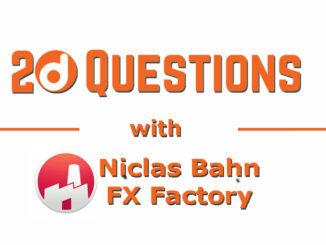 16: How does your workstation handle workflow? Our workstation is a piece of your workflow. We have to talk to you about your entire workflow to understand how it fits for you specifically. For example, if you are filming on location and want to have a rough-cut produced on site, then we know we need your workstation to be portable (perhaps with a hard-shell carrier). If you already have an extensive investment in storage, we have to design the workstation with optimal access to that storage. 17. We keep hearing a lot about cloud storage. Where is Puget on the whole cloud computing thing? There is a long way to go. What is great about the cloud is how many resources you have easily available to you. You can store projects without having to worry about backup or how to get access to them. You can buy rendering time without having to invest upfront in hardware. With the click of a button, you can sign up to a service that gives you a capability you didn’t have before. What people find though, is that it comes at a cost. Trying out the cloud is cheap…using it every day for your work is expensive. Plus, getting data in and out of the cloud takes time, and is also expensive. There will always be a place for the cloud, and for local hardware. Just like with knowing how much budget to allocate to the CPU and GPU, investments you make in local hardware vs cloud services is a balance that will always be changing over time. But I firmly believe that both will continue to exist far into the future. 18: What do you think is computer design? What’s on the horizon? Computers are going to become more specialized over time. There is a ton of diversity in technology out there, and that diversity means that there is no one-size-fits-all approach anymore. Specialized hardware, performing a specialized function…that’s the future. That makes workstation design more and more complicated, which means that companies like Puget Systems are even more valuable, because it takes a LOT of work to keep up on all those technologies. You shouldn’t have to be an expert in PC hardware to do your job. Let us carry that burden, so you can get back to work! 19: What’s in your camera bag? The tools of my job are different than yours! I don’t carry a DSLR, I carry a thermal imaging camera! 20: Where can people go to learn more? The best part of what we do is that we share it freely with the world. Check out our website! You can read up on all the testing we’ve been doing in our articles, or you can cut to the chase and see what workstation design conclusions we’ve drawn from all that testing, in our solutions area. If you have questions, we’d love to talk to you. You can read dozens of articles, but there’s no substitute for a good phone call!